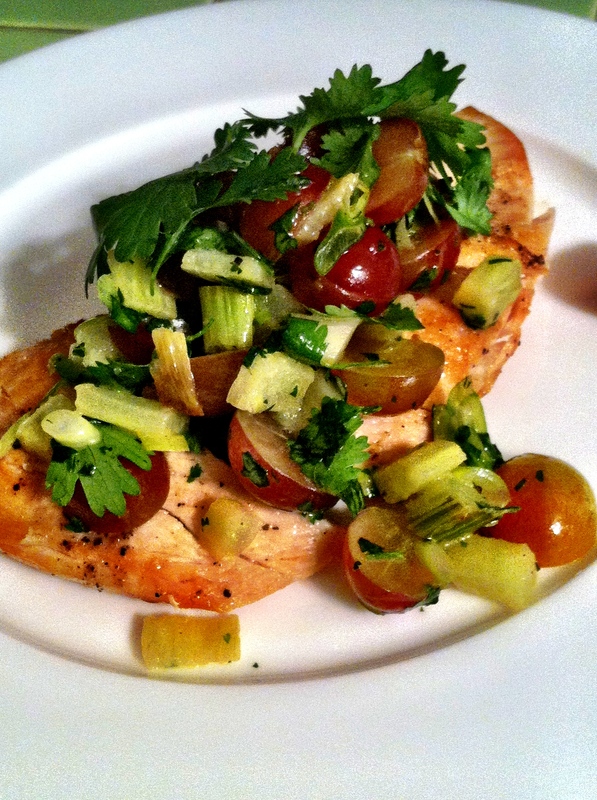 If you’re looking for a quick weeknight meal, try this chicken recipe. A pan-seared chicken breast topped with a versatile fresh salsa is the perfect solution to getting dinner on the table in a flash. green grapes, cherries or even pomegranate seeds when in season. Feel free to change up the ingredients to your liking. Dig a little heat? Add some thinly sliced red or green chiles. Want to add cheese? Any dry, crumbly, salty cheese such as feta, cotija, halloumi, or ricotta salata would be a beautiful addition. Even the herbs are a toss up. Tarragon instead of cilantro would enhance the licorice flavor of the fennel; if you’re like me you likely have fresh parsley in the fridge at all times, add it in! Of course the original recipe is sweetly satisfying…just as is. Cut the fennel in half through the core, then separate each layer. Slice each layer into strips, then cut the strips into small chunks. Heat a medium skillet over medium heat and add 2 tablespoons of olive oil. Add the fennel and a pinch of salt, and cook over medium heat until tender, about 15 minutes. 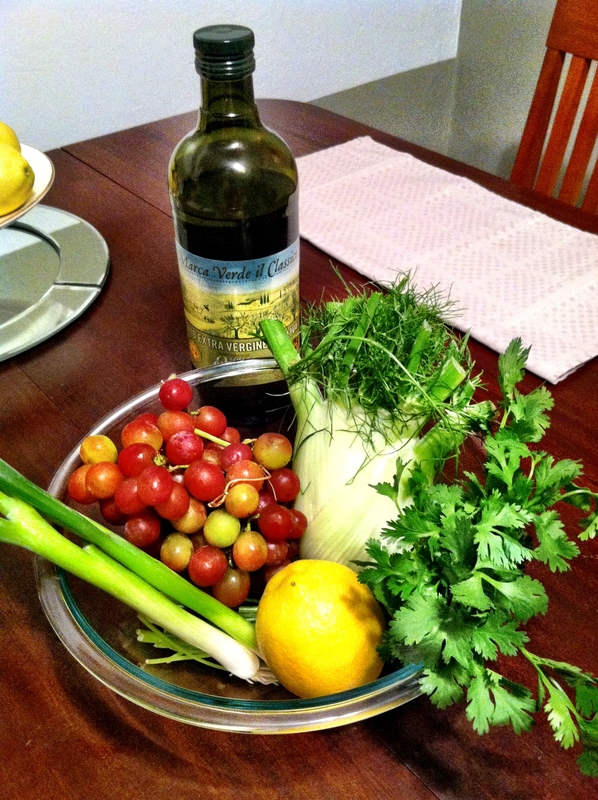 Transfer fennel to a bowl and add the grapes, green onions, cilantro, lemon zest and juice, and honey. Stir to combine. Season with salt and pepper to taste. Set aside while you cook the chicken. Place one chicken breast flat on a cutting board. 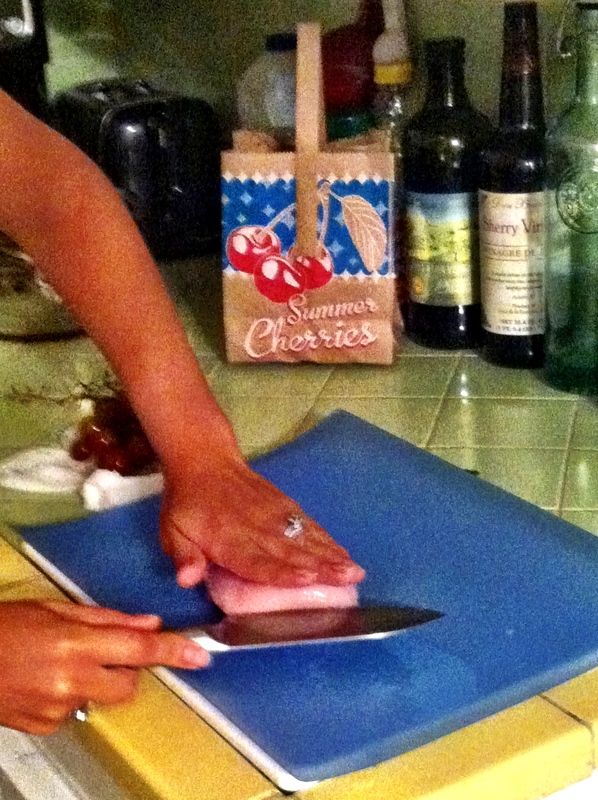 Place your knife parallel to the cutting board with the blade in the center of thickest mass of the breast. With long, slow strokes, slice the chicken into two equal pieces. Now you should have 2 thin breasts, from one thick breast. (Keep practicing this technique, once you have it down, it will save you cooking time and money! – Of course you can just ask your butcher to halve the breasts for you.) Heat the remaining tablespoon of oil in a large skillet over medium-high heat, until very hot. Season your halved chicken breasts with salt and pepper and pan sear each breast, until golden brown on the first side, about 5 minutes (don’t turn the meat over until you have a nice golden brown color and it releases on its own). Flip and sear on the second side until cooked through, about 5 minutes. Transfer to a platter and let rest, loosely covered for a few minutes. Serve the chicken topped with the reserved salsa and enjoy!